For other uses, see Tiara (disambiguation). For the crown worn by Popes, see Papal tiara. 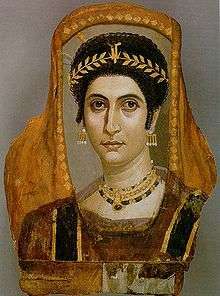 This Fayum mummy portrait shows a woman wearing a golden wreath, c. AD 100-110. Today, the word "tiara" is often used interchangeably with the word "diadem", and tiara is often translated to a word similar to diadem in other languages. Both words come from head ornaments worn by ancient men and women to denote high status. As Geoffrey Munn notes, "The word 'tiara' is actually Persian in origin — the name first denoted the high-peaked head-dresses of Persian kings, which were encircled by 'diadems' (bands of purple and white decoration). Now, it is used to describe almost every form of decorative head ornament." Ancient Greeks and Romans used gold to make wreath-shaped head ornaments, while the Scythians' resembled a stiff halo that would serve as the inspiration for later Russian kokoshniks. The use of tiaras and diadems declined along with the decline of the Roman Empire and the rise of Christianity. Queen Elizabeth II is said to have the largest and most valuable collection of tiaras in the world, many of which are heirlooms of the British Royal Family. She is often seen wearing them on state occasions. Her personal collection of tiaras is considered to be priceless. The Queen received many of them through inheritance, especially from Queen Alexandra. Queen Mary, consort of King George V, purchased the Grand Duchess Vladimir tiara in the 1920s. It consists of numerous interlocking diamond circles. Pearl drops can be attached inside the circles or emeralds. Queen Mary had a tiara made for the Delhi Durbar held in 1911 in India. It is now on loan for wearing by the Duchess of Cornwall, wife of Charles, Prince of Wales. Queen Elizabeth II commissioned a ruby and diamond tiara. A gift of aquamarines she received as a present from the people of Brazil were added to diamonds to make a new tiara. Tiaras made of plastic, rhinestones, Swarovski crystals, or any other non precious material are considered costume jewelry. They are worn by women on special occasions such as homecoming or prom and at their quinceañera or wedding. They are also worn by the winners of beauty pageants and girls dressing up as Disney princesses. ↑ "Royal Splendor 101: Tiara Rules". The Royal Order of Sartorial Splendor. 10 October 2011. ↑ "Royal Splendor 101: Tiara Terminology". The Royal Order of Sartorial Splendor. 5 December 2011. 1 2 Munn, Geoffrey (2002). Tiaras: Past and Present. 160 Brompton Road, London: V&A Publications. ISBN 0-8109-6594-1. ↑ Munn, Geoffrey (2001). Tiaras: A History of Splendor. England: Antique Collectors' Club Ltd. ISBN 1851493751. ↑ "Aquamarine and diamond tiara". Retrieved May 17, 2010. ↑ Sowray, Bibby (16 May 2013). "Cartier recreate Grace Kelly's jewels for Nicole Kidman film Grace of Monaco". Telegraph. Retrieved 21 September 2015.